I am in scenic Miami again for couple days only this time it is completely unrelated to my incredible television program ”The King of Miami.” This time I am shooting something that will appear on basic cable television on another channel and hopefully the people of North America will be really excited about it. 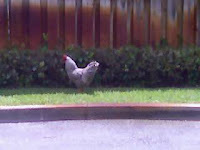 Speaking of exciting, yesterday I was standing in a Burger King parking lot in Miami and the big rooster above just came out of nowhere and started running around. He really added to the mayhem in a really nice way. When in doubt, throw a live chicken into the mix and see what happens. That’s what I always say. I tried to get closer to him to get a better picture but he wasn’t having it. Then again, I guess if I were running around just a few feet away from a restaurant that serves crown-shaped hunks of meat made from my relatives, I might not be all laid back about things either. Really, it’s tough to say.